We are actively working on bicycle projects throughout San Diego County. View our important action alerts and priority campaigns below. We are looking for advocates to help get these projects built. Use the City of San Diego’s “Get it Done” App!! Use the City of San Diego’s “Get it Done” app to report any infrastructure problems or pot holes that are hazardous for cyclists. Click here for more information and to download the app! There are two bikeways constructed along state route 15 between Camino Del Rio South and Landis Street. The name of these two bikeways are the SR 15 Commuter Bikeway and the SR 15 Central Avenue Bikeway. These bike ways will provide on-street bike connections from Old Town and Mission Valley through Uptown to Downtown, North Park, and Balboa Park. The Downtown Mobility Plan is a vision for Downtown San Diego that was passed in June 2016. 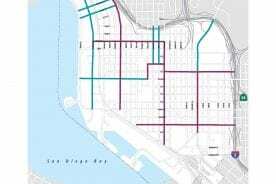 This plan aims to accommodate all modes of travel, as city planners many years ago designed downtown’s streets with travel lanes only for cars and sidewalks only for pedestrians — leaving bicycles out of the equation. 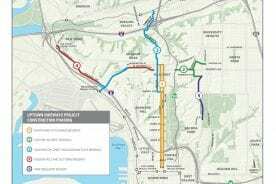 A $200 million initiative to expand the bike network countywide and finish high-priority projects within a decade. SANDAG Board of Directors approved this on September 27, 2013. The Regional Bike Plan was adopted to provide a regional strategy to make riding a bike a useful form of transportation for everyday travel. The Regional Bike Plan supports the call for more transportation choices and a balanced regional transportation system that supports smart growth and a more sustainable region. 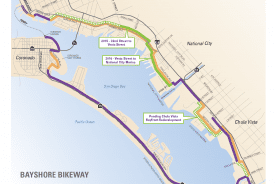 This project will close a major gap in the Bayshore Bikeway with a Class 1 connection to downtown San Diego and the Bayfront promenade to the convention center. 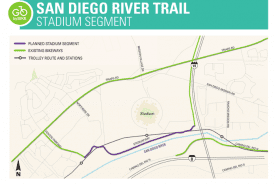 The Coastal Rail Trail is a planned continuous bike route that runs approximately 44 miles between Oceanside and Santa Fe Depot in Downtown San Diego. 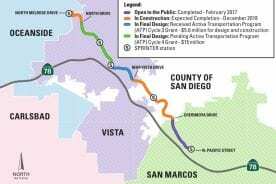 The Coastal Rail Trail was initially planned in the mid-1990s, and is being constructed in segments by SANDAG and the various cities it traverses. 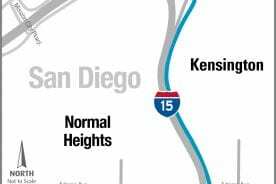 The Rose Creek and Encinitas segments are the high priority projects identified in the San Diego Regional Bike Plan to be funded for implementation. This project will make it safer and easier for people of all ages and abilities to navigate through North Park/Mid-City communities via 13 miles of bike boulevards and protected bikeways. 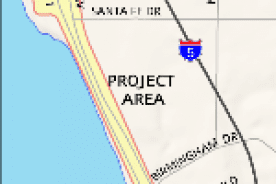 The Border to Bayshore Bikeway is an approximately 8.5-mile route that will provide safe biking connections within and between Imperial Beach, the San Ysidro community of San Diego, and the world’s busiest land border crossing at the San Ysidro Port of Entry. 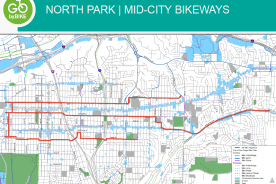 This is a 2.6 mile bikeway that will provide a crucial north to south connectivity between North Park and Downtown. The Regional Bike Walk Alliance was created by the Bike Coalition in partnership with Circulate San Diego.The Alliance brings together local community leaders and bicycle and pedestrian advocates to develop strategies to support the implementation of the San Diego Regional Bike Plan which will ultimately get more San Diegans riding, encourage healthy and active lifestyles and be a leading example of how local advocacy can influence regional growth policies. 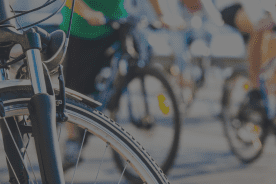 The Bike Coalition supports these local groups by providing them with resources, membership and guidance with their advocacy and education efforts. 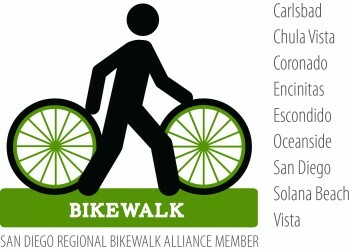 There are currently 9 cities in the county that have a Bike Walk group affiliated with the Alliance. Bike Coalition members can now opt to join a local Bike Walk advocacy group when they join or renew their membership with the Bike Coalition. Join or renew today. Advocacy Civics 101: Who to call when you want something done!